Depending on where you live in the northeast, you will be surrounded by different types of industry. Some scrappers benefit by living near areas where there is a lot of construction or manufacturing plants, while others will benefit from living in urban areas where there is a lot of electronic, appliance or automotive scrap to be found. 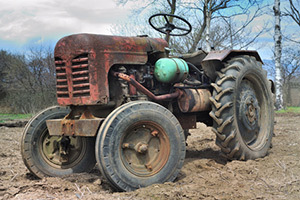 Scrappers who live outside the big cities can benefit too and if you live in an area where agriculture is common, you will soon discover that there is a lot of farm scrap metal to be collected. Like any other type of business, it is important to start by building local contacts. If you already know a few of the farmers and agricultural businesses in the area, make sure to let them know about your scrap metal collection service. Farm equipment can be quite heavy and large, so a lot of times they just want it hauled away and don’t know who to call for that type of service. Word-of-mouth advertising in the farming community is worth its weight in gold, so for every job that you do, you can count on your clients telling others about the work that you did for them. Small jobs can lead to big jobs and medium sized jobs can lead to regular, steady pick-ups, so make sure to make a good impression and do a professional job every single time. Use local resources, such as the Penny Saver, Craigslist, local newspapers, newsletters, church bulletins or any other publication that can help you reach new clients. Check out local online message boards, forums and support centers that are frequented by area businesses and share your information in a polite and professional manner. For many people this will be their first impression of you, so make sure to post respectfully, check your spelling and use good grammar. You can also check with local agricultural businesses, such as feed and seed stores, tack supply and other places that farm businesses would frequent, to see if you could post a notice on a bulletin board or window about your scrap metal collection services. In order to make a profit, you will need to make sure that you are selling your farm scrap metal at the best price. Contact Mid City Scrap Iron & Salvage to get the latest information on the best Massachusetts scrap metal prices. They can give you the current rates over the phone or you can stop by and check with their staff when you come to sell scrap metal in Westport. Prices fluctuate depending on national and international market rates, so it’s always good to stay informed of any gains or losses. Another tip for making sure that you get the best Massachusetts scrap metal prices is to properly separate your metals before taking them in to sell them. Sorting scrap metal by ferrous and non-ferrous metals is the very least that you should do to ensure smooth processing at the scrap metal recycling facility. Beyond that, learn the different types of metals so you’ll know what types are worth more than other types. For example, copper is a very valuable type of farm scrap metal and it should be sold separately from other types of metal in order to get the best payout. Massachusetts scrap metal prices are on the rise, especially following the Q4 2013 news which revealed that Turkey is expected to continue making large purchases of scrap metal from the United States through the year 2020. Other countries are also interested in purchasing your scrap metal collection via local recycling facilities. American Metal Markets is the current standard for news regarding the scrap metal industry and they have indicated that Japan will also be increasing their demand of scrap metal from the U.S. in the coming months, which could be big for scrappers who collect farm scrap metal. So you might be wondering what type of items you would find on a farm for scrap metal collection. Believe it or not, when it comes to farm scrap metal, there are a lot of different things that can be collected to sell as scrap metal in Westport. Old farm plows – rusty or not, old-fashioned reapers, hog oilers, buckets and pails, old metal fencing and heavy saw tools. You can also bring in agricultural engines, portable engines, traction engines and steam tractors. The older the tools, the better with regard to the weight and amount of farm scrap metal you’ll be able to collect. Tractor parts, tubular steel, leftover metal from repairs or construction, plate steel – the sky’s the limit. Whatever you can add to your scrap metal collection, just make sure to bring it to Mid City Scrap Iron & Salvage, where you can sell scrap metal in Westport and get the best Massachusetts scrap metal prices available. Visit the rest of our website for information on our hours of operation, directions to our Westport, MA facility and details on our scrap metal recycling procedures. If you have any questions about something you have collected in your farm scrap metal business, give us a call – we’re here to help!